Armed with only a small tool kit, wild amounts of optimism and a complete lack of knowledge about dismantling greenhouses we set off for Nantwich ready to start work. We arrived and sorted out our plan of action – we decided to start with the roof (the top part before working down to the base of the roof) before moving on to taking the glass out of the sides. The ladder put up and Fiona in residence up it, we began by using a flat head screwdriver to prize out the clips holding the glass in place. Next we slid out the glass and stacked it on the lawn. The first side of the roof glass came out fairly easily however, the other side was almost impossible. The greenhouse was overshadowed by several massively overgrown budlea trees. Poor Fiona struggled to get enough room to take the glass out whilst simultaneously holding large branches out of the way. With only 2 panes breaking from the roof, we congratulated ourselves. Then we hit a serious problem. The halfwit who had put this greenhouse up had decided in his infinite wisdom to use an excessive and completely unnecessary amount of putty to glue said glass panels into place before adding the clips, some of which were nearly impossible to remove. Genius. Not. Sadly it was not only a few panels but EVERY SINGLE bit of glass below the roof including the door! To say we subsequently endeared ourselves to the neighbours seems unlikely judging from the air being blue with curses raining down on the head of the muppet who built it. Several broken panels later we had both ends and one side of the greenhouse free from glass. 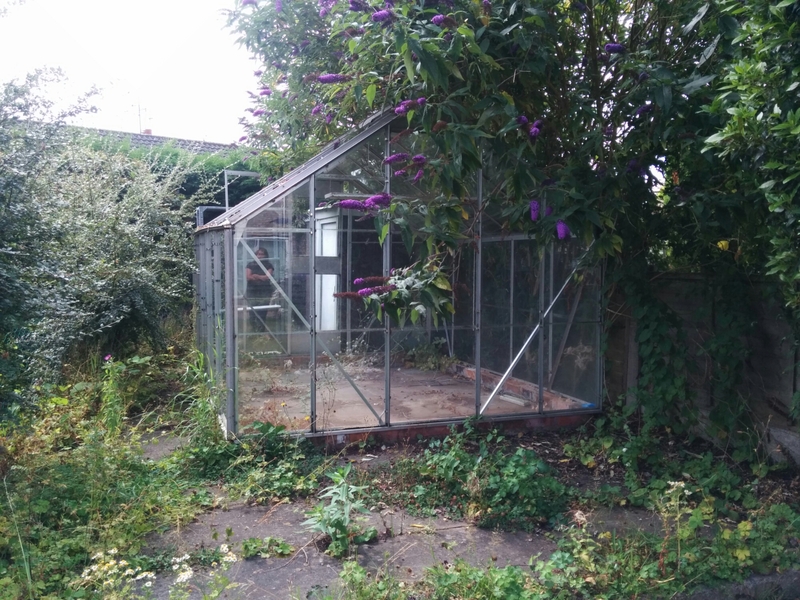 The final side of the greenhouse was impossible to deal with as it was completely overgrown. At this point my friend and her parents came out to see how things were progressing. As a group we decided to move the greenhouse several feet to the left to enable us to have enough room to remove the glass. Seems simple enough doesn’t it? Oh if only! It turns out that the moron had successfully managed to cement in the brackets securing the greenhouse into the brick base, and just in case this wasn’t enough, he had also managed to drill 4 inch wrall plugs into the brickwork, meaning that even the strongest hurricane roaring past Nantwich would not be able make the frame move even half a millimetre. Armed now with a large hammer and a masonry chisel we began to smash the bricks, ignoring the loss of brackets in our desperation to release the base whilst we had 4 pairs of hands to move the frame. The last bracket was not only cemented in, but he had clearly been trying to use up the end of the cement mix by pouring it onto and next to the last bracket. Eventually, it gave up and armed with a mass of helpers we moved the greenhouse from its brick base onto the lawn enabling us to remove the remaining glass before tackling the frame the following day. We packed about 10 panes into the back of the car and drove at a rapid speed of 20 mph the 5 miles to the allotment, dropped them off and crawled home to showers and takeaway dinner.